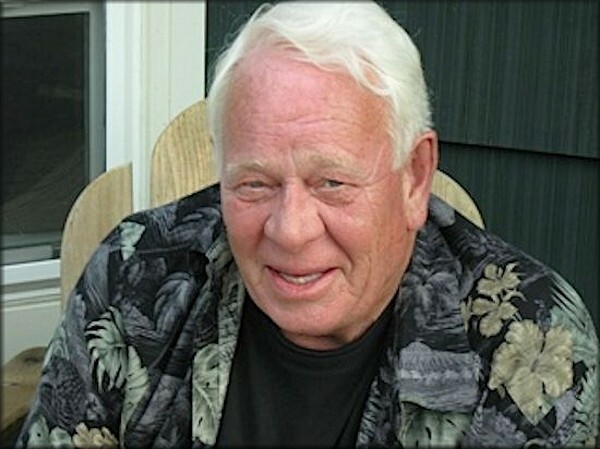 Russ Anderson was a friendly, reserved, smiling, and witty guy. In a group he quietly observed and did not speak out often, but when he did it was remarkably perceptive and often incredibly funny. He had a dry sense of humor and a quick, sarcastic wit. During arguments, or in other tense situations, Russ was a peacemaker because he could break the tension with a carefully-timed, short, witty comment. In 1964, during the spring of our sophomore year at Brigham Young High School, I broke my foot while wrestling in P.E. Normally, I would have been playing on the baseball team and running in track meets, but I was sidelined on crutches, and quite frustrated. One day Russ invited me to come over to his home after school, and said he would teach me how to play the guitar. 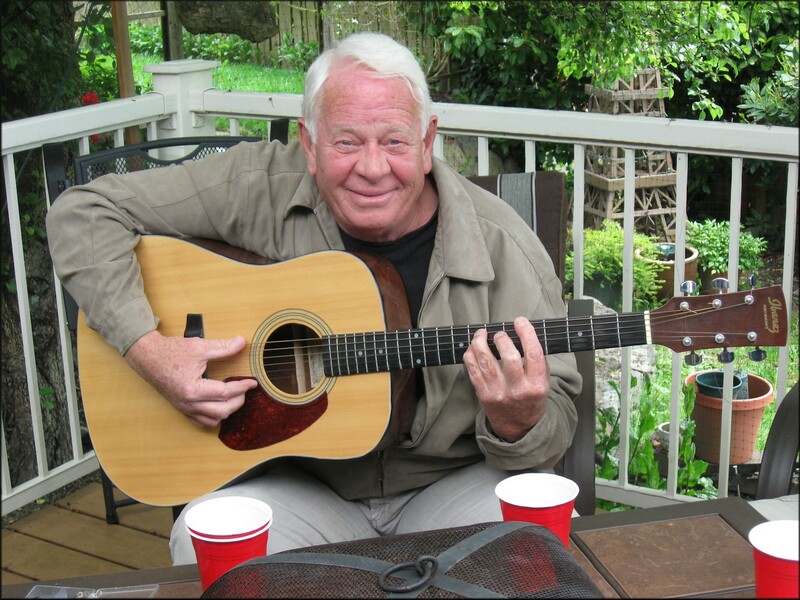 I remember sitting in a comfy chair in his spotlessly clean living room with his “Harmony Sovereign” guitar and a Kingston Trio songbook at hand. Russ patiently showed me the finger-positions for the chords, and we made our best attempts at singing the songs together. At the time, I had no idea how learning to play guitar would change my life. I was invited to play that summer in the famous Provo 4th of July “Panorama” with Russ and a couple of other BYH classmates, Lonnie Keith and Scott "Rhine" Bernhard. A group of guitar players, seven BYH students and two Provo High students, got together in a performing group called the "Coachmen". Although I was not a member of the original group, I was later invited to join, if I would upgrade my uncomely and prestige-less “Stella” guitar to a Harmony Sovereign, like Russ. I also had to procure the necessary matching green-plaid shirt. Singing, playing guitar, and associating with the Coachmen became one of the most significant parts of my life. 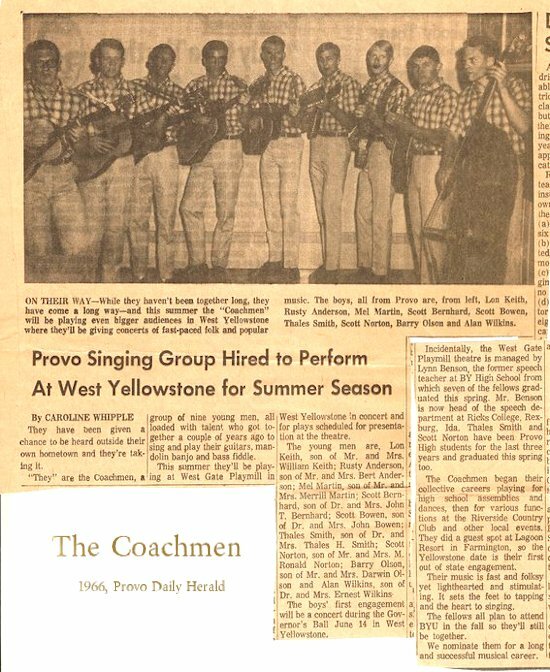 After our graduation in May of 1966, our Coachmen group was invited to spend the summer of 1966 performing in the summer-stock “West Gate Playmill Theater” in West Yellowstone, Montana. The Playmill Theater had been co-founded by J. Lynn Benson, our former Speech & Drama Coach at BYH, and he and his wife Fern operated it for 25 years. During the academic years, Benson taught drama at Ricks College for 25 years. He eventually became Faculty Emeritus of BYU Idaho in Theatre and Dance. During the days that summer we also worked in the Old Faithful Hamilton Stores at Yellowstone, and we shared endless, memorable experiences. I formed life-long friendships, and together we created loads of what we now affectionately call “reminiscing material". During my two-year LDS mission to Germany, I had the opportunity to play guitar and sing in a group appropriately called “The Mormon Brothers”, which enhanced my musical skills. Over the next 10 years I performed with a couple of popular rock bands for dances at high schools, colleges, bars, and night clubs, which helped me pay my way through college, pay the bills, and also save for a down-payment for our home. 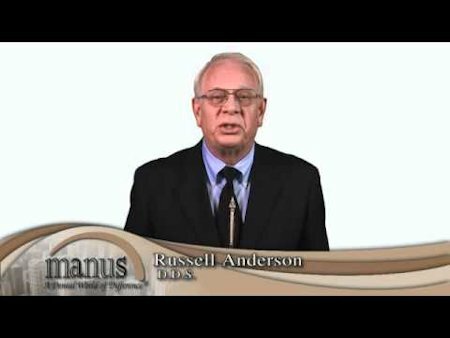 After graduating from BYU with a Bachelor of Science in 1970, Russ moved to Chicago. In 1974 he earned his Doctorate Degree from Northwestern University Dental School. Also in 1974 he was appointed a full-time faculty member at the Northwestern Dental School. He served as a Professor in the Restorative Department. After our Coachmen days, I didn’t see Russ often, except for a few Coachmen reunions, because of his professional career. I have many fond memories of singing, playing, laughing, and generally goofing around with Russ and the other members of our Coachmen group. I am particularly grateful for the time that Russ offered to me while patiently trying to teach me how to play the guitar. Through this, Russ changed my life in the best possible ways! Russ Anderson was in my class at B.H. High, but I didn’t know him that well otherwise until the Provo "Panorama" 4th of July celebration in 1964. I got to know him a bit better while rehearsing for the western folk music section of the big show. A couple of weeks after the show, another classmate, Lon Keith, called me and suggested that we form a folk group and include Russ. That’s when my friendship with Russ really began. American folk music gained in popularity for several decades, peaking in the 1960s. 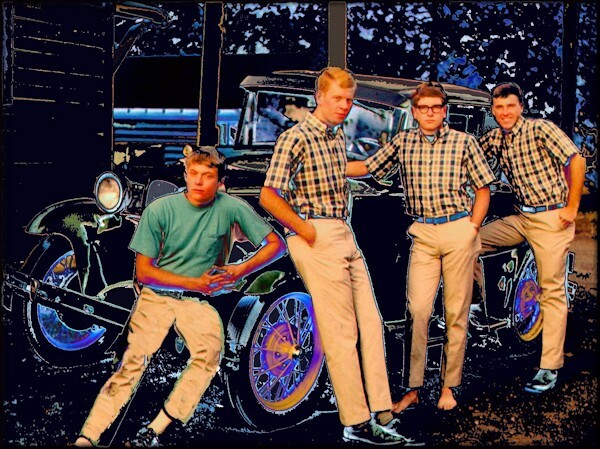 We were influenced by the Kingston Trio, the Brothers Four, Peter, Paul and Mary, The Limeliters, The Chad Mitchell Trio, The New Christy Minstrels and more. Like the rest of us in the Coachmen group, Russ was out for a little local glory without necessarily having to work too hard to get it. 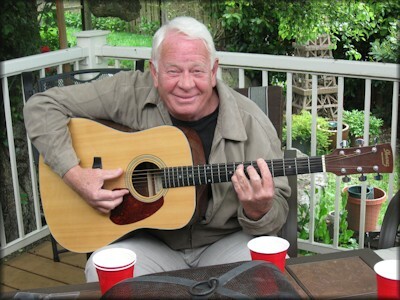 Russ satisfied all the requirements for acceptance into the Coachmen brotherhood – he had a nice-looking Harmony Sovereign guitar and knew a few chords, he had a long-sleeved yellow shirt, and he could carry a tune (in order of importance). Sarcasm reigned supreme during the years the Coachmen played together, but some of the guys in the group had, shall we say, a more demonstrative sense of humour than others. Russ was a bit more laid back in his style and yet would regularly crack us up with his responses to, or summations of, whatever foolishness we were wasting our time on instead of practicing. I remember Russ quietly tossing out a zinger every once in a while. Lon Keith, Mort Martin and I shared a cabin with Russ in West Yellowstone when the Coachmen were invited to sing at the West Gate Playmill Theatre during the summer of 1966. Mort and I shared a room, and Russ and Lon took the other room. Russ had previously broken their bed, lord knows how, and one day when I was lounging on the bed in our room, Russ walked in and said, “I’m going to break your bed.” He lightly sat down on the edge, and the bed collapsed. I was laughing so hard I didn’t think to ask if he had previously fooled with the bedframe. I just assumed that Russ was a bed breaker and left it at that. One night in West Yellowstone, after the Coachmen had finished performing, Russ and I found ourselves with nothing to do. Russ was bummed about something, so I suggested we go watch the grizzly bears rummage through the garbage at the dump just outside of town. I said maybe we could have a “Miss Turley Help Session” -- Miss Donna Lee Turley was one of our student advisors/ guidance counselors at B.Y. High. I drove us out to the dump in my little Fiat sedan and we found a great spot to sit and talk and watch the bears. It was a warm summer evening, and Russ and I both had our windows rolled down with our elbows out the window. As we faced each other in the car, I suddenly saw a huge, dark mound that reached half way up the window, moving slowly between my car and the one behind Russ. When it stopped momentarily next to Russ’ elbow, I pointed to his window and said, “Uh......Russ, uh.....” I’ve never seen anyone manually roll up a car window faster than Russ. Russ and I only saw each other a half a dozen times at reunions after the heady heyday of the Coachmen, but my memories of him are ever-present. Even in my sadness at his passing he makes me laugh. BYH Class of 1966. Bert Russell Anderson -- the guy with the funny initials -- that he changed right away. 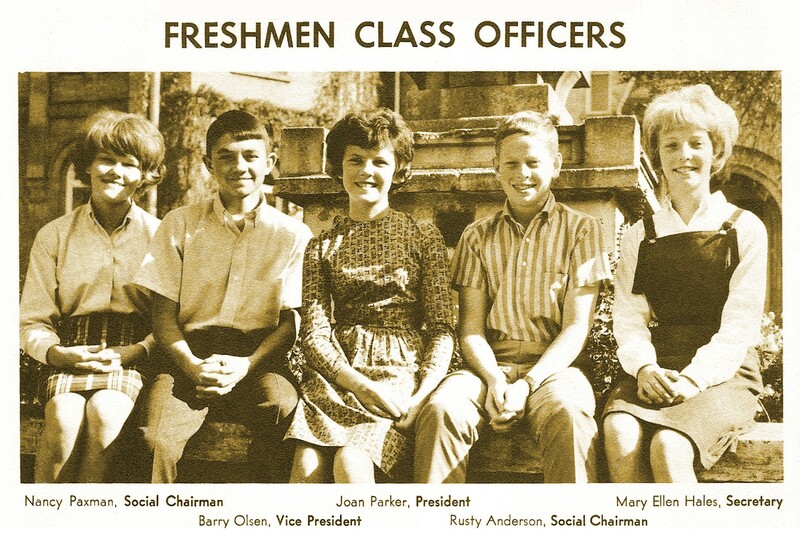 In high school Rusty participated as a Freshman Class Officer - Men's Social Chair, Baseball, Ski Club, Lettermans Club, Chorus, Wildcat Yearbook, Student Council, Boys State, and Seminary all four years. Rusty was born on January 22, 1948 to Bert Duke Anderson and B. Louise Russell Anderson. His parents, high school sweethearts at Provo High School, married in 1933 and had two children: Carol Anderson (Bruce) Jones; and Bert Russell "Russ" or "Rusty"(Christina M. Jones) Anderson. Bert's family owned the Anderson Garage on Center Street in Provo, and Bert spent his life working at the family business. Louise's father, Sydney Russell, was co-founder of one of Provo's original department-furniture stores, Dixon Taylor Russell. Louise worked at BYU for 24 years, primarily in the Office of Admissions. She was a vital employee and was given the honor of "Lighting the Y" for Homecoming. The Anderson family resided at 71 West 3rd North in Provo. Their two children, Carol and Russell, were separated by 16 years in age, and their parents had fun raising "two families". By the time Russ was three, Carol had married Bruce Jones, DDS, and moved to California. Carol and Bruce Jones have 7 children and 32 grandchildren and many great-grandchildren. After graduating from BYH in 1966, Russ studied at Brigham Young University where he earned a Bachelor of Science degree in 1970. In 1974 he earned his Doctorate Degree from Northwestern University Dental School, with academic honors. 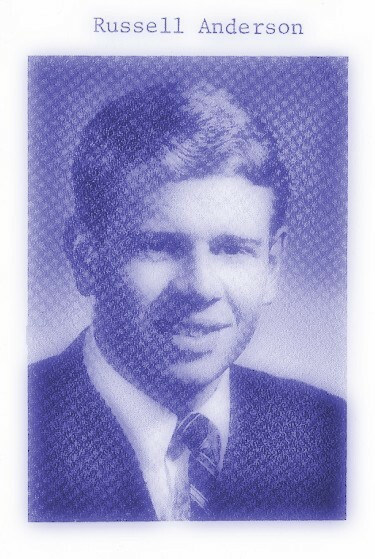 Dr. Anderson was appointed to the Northwestern Dental School as a full-time faculty member in 1974. He served as an Associate Professor in the Restorative Department, lecturing and teaching all phases of restorative and cosmetic dentistry, until the closing of the Dental School in 2001. He also maintained a private practice in Chicago. Dr. Anderson was a member of the Academy of Operative Dentistry. His students in 1987 and 1993 honored his outstanding efforts for clinical excellence. Russ married Christina M. Jones in May of 1974, right around the time he graduated from Northwestern. The Anderson family, including 11 children, resided in Crown Point, Indiana. In his spare time, Russ enjoyed restoring older cars and 1960’s folk music. Dr. Russell B. Anderson died in Crown Point, Indiana on April 28, 2013, at the age of 65. His interment was at Lowell, Indiana. Russ was survived by his wife of 40 years, and by eleven children, including six adopted children: 1. Hilary, 2. Eden, 3. Greyson (Kelly), 4. Russ, Jr. (Christina), 5. Alex, 6. Hayley, 7. Carly, 8. Caroline, 9. Molly, 10. Joel and 11. Zachary. He was also the grandfather of four grandsons, Thatcher, Miller, Cooper and Colin. Russ was also survived by his sister, Carol Anderson Jones.